The first version of a new Internet technology is rarely the one that wins mass adoption. Early versions of the browser, search engine, email provider, and social network were exciting, but ultimately overtaken by later rivals. Behind all the hype and speculation about Bitcoin over the last month, now gradually dying down, there is a far bigger story being missed. The real disruption is not be Bitcoin itself, but the new genre of online exchange it represents, the community-driven digital currency. See end of article for a primer on Bitcoin. Bitcoin is the first of a kind, and maintains formidable lead over rivals, but it has also done the hard work of introducing potential users to the idea of a cryptographic currency. Released in early 2009, Bitcoin first circulated on the fringes of the online economy, largely invisible to the mainstream consumer. Discussion of the currency cropped up occasionally on mainstream technology websites such as Slashdot, but usually as a curiosity. February 2011 saw the launch of Silk Road, an online black market which required its customers to use Bitcoin for purchases. As the currency accumulated attention it increased in value, which warranted more media attention, which fuelled further price growth. From April to June 2011 Bitcoin first experienced a peak in price and media prominence, and the market value increased thirty-fold in under three months. Supporters hoped the currency was on the cusp of widespread adoption, but instead the price and attention bubbles collapsed. Why exactly the price collapsed is up for debate, some point to a massive security breach at Mt Gox, the largest Bitcoin exchange, others wrote it off as the bursting of a classic speculative bubble. In the months that followed, Bitcoin gradually fell out of the news cycle. This is Gartner’s Hype Cycle. 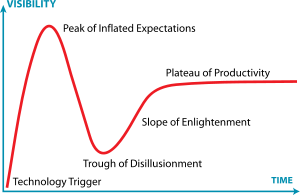 The premise of the Hype Cycle is simple, that promising technology will usually experience a period of inflated expectations early in its history. After those expectations are not met, the technology drifts out of the public eye until eventually a more mature, gradual, and nuanced implementation of the technology results in its mass adoption. So with the 2011 boom and bust behind it, does the 2013 boom show Bitcoin is edging towards the Plateau of Productivity, or is it climbing a second Peak of Inflated Expectations? The road ahead for Bitcoin is certainly rocky, but the currency’s success thus far has been driven by a number of advantages that are not going away soon. Bitcoin’s owes its resilience to its distributed, decentralised structure. Although a number of ad hoc organisations have formed to serve and promote the currency, Bitcoin is essentially a peer-to-peer protocol, comparable to BitTorrent. It is very difficult to eradicate a protocol. Like a language, it exists as long as people use it, and cannot be easily requisitioned or quarantined. As long as there is an Internet and community that wants to use Bitcoin, there will be Bitcoin. Much of Bitcoin’s market value lies in this perceived persistence. Bitcoin’s value is also subject to a network effect, just like a language, a protocol, or a social network, the more people that use Bitcoin, the more valuable it is. Designing a currency with no central authority is a firmly political move, but has profound economic implications. New units of Bitcoin (BTC) cannot be arbitrarily minted by a central authority, so the currency is intrinsically deflationary as long as its use is growing. As new users drive up the price of BTC, the price of goods (in BTC) is constantly falling. Deflation radically changes consumers different relationship with savings, debt, and purchasing decisions. Although Bitcoin is unlikely to go away, and a government effort to ban it would be unlikely to succeed, it does have a number of structural weaknesses that obstruct mass adoption and legitimacy. The Bitcoin economy remains heavily dependent on parasitic economic activity (currency speculation and gambling) and transactions that users want to hide (namely buying drugs on Silk Road). The dependence on this activity may be overstated, in a survey of 1,000 Bitcoin users far more reported making gifts and donations than buying drugs. But reputation matters, and Bitcoin’s colourful background makes any kind of corporate blessing problematic. Bitcoin also faces technical and social complications as it scales. The community is welcoming, but newcomers are daunted by the massive digital wealth of early adopters, and the obsession with price and profit echoes that of a Ponzi culture. Bitcoin is resilient in the face of these and other problems because it offers users a frictionless service that they can’t get elsewhere: nearly free, nearly instant, semi-anonymous transactions that circumvent borders, governments, and banks. That may also be Bitcoin’s greatest weakness. As the first-of-a-genre digital currency built entirely on cryptography, a “cryptocurrency,” it is still basking in the warm glow of being the only dog in town. * That initial advantage could collapse in the face of an industry-backed currency accepted on Ebay and Amazon, or a gamified and socially driven currency linked to Twitter or Facebook accounts. A rival cryptocurrency could also originate from a progressive or provocative state, and Bitcoin might struggle to become mainstream if users could avail of an alternative backed by Iceland or Antigua. Despite its transgressive nature, including the ominous macro-level impact of structural deflation, the micro-level efficiencies of digital currency show it has the potential to be a disruptive technology that will seep inexorably into mainstream use. In this case digital currency would join the ranks of open source software, wiki culture, even the Internet itself. In its final form a mainstream digital currency might be less anarchic than Bitcoin, but it will still be transformational, and it will maintain much of its political heritage. Bitcoin may never get out of the Trough of Disillusionment, but the wider genre of digital currency will. Bitcoin is a computer protocol which functions as a digital currency. At first glance, it looks more like a decentralised network of bank accounts. In very simplified terms, each user has a file on their computer, called a blockchain, which acts as a sort of village ledger. Inside that blockchain is a record of how many bitcoins (or “BTC”) every user has, and a full history of transactions. If you transfer BTC to another user, it updates your blockchain and everybody else’s. Bitcoin uses an elegant cryptographic setup to verify transactions and prevent double spending. Users can earn BTC by contributing their computing power to the network. Bitcoin was released online pseudonymously in January 2009. *Rival cryptocurrencies do exist, including Litecoin, PPCoin, and Terracoin, but Bitcoin remains the only one widely used outside the community of cryptocurrency enthusiasts. What do people actually buy with Bitcoins?